KERN COUNTY, Calif. -- Bumping along a wide, gravel road, Jon Parker deftly maneuvers his pickup truck while simultaneously pulling out a collection of laminated maps from his center console. Dotted with brightly colored squares, the maps show the extent of the 32-square-mile Kern Water Bank. Thin lines cut through the patchwork illustrating who puts in water when it's wet, and therefore who can take it out when it's dry. The water bank is basically an ATM for water, and in drought-stricken California, water is currency in itself. While floodwaters might cost a farmer $2 to $3 an acre-foot, buying water on the market four years into the current drought might fetch something closer to $1,200 per acre-foot. This year, the state is banking on something else: El Niño. The powerful weather system has already dumped both water and snow on the state. As of Tuesday, snow survey data from the California Department of Water Resources showed snow levels at 56 percent of the historical average for Dec. 1, up from 24 percent a year ago. Groundwater flows into the Kern Water Bank's canal after being drawn up by the facility's pumps. Because of the geology in the area, the water is clear and clean. "That's why we bring the Boy Scouts out here to do their canoeing badge," explained Jon Parker, general manager of the bank. Photo by Brittany Patterson. 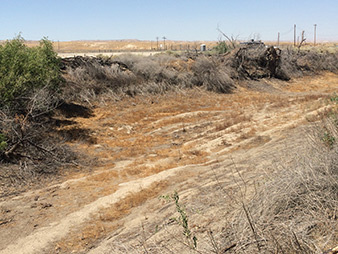 Still, experts say the state has a long way to go before it's out of the drought, a drought that could have been slightly less painful if the state's groundwater resources had been replenished to their full capacity, ready for use when the water got scarce. Located off Interstate 5 in California's agriculture-rich Central Valley, the water bank at capacity can store about 1.5 million acre-feet of water. If water is plentiful, the bank can put about 500,000 acre-feet in the ground and bring back up about half of that for use in a year. To place that in perspective, 1 acre-foot of water is enough to meet the needs of two families of four for a year. As the truck zooms by a canal full of crystal-clear blue water, about 30 feet wide and equally as deep, Parker gestures to a vast extent of dry, brown land, dotted with hearty-looking shrubs and dried-up cattails. In wet years, that landscape would be awash in cerulean blue. The recharge ponds can filter water into the underground aquifer at a rate of 0.2 to 0.4 feet per day. In addition to the bank's participants choosing to place their water allocations from the State Water Project into the water bank, during wet years, the bank can take excess water from the Kern or Friant rivers. It is operated by the Kern Water Bank Authority, which is a public agency operating as a joint powers authority. It includes six member entities, including several water districts, a water agency and a water company. "We haven't had water in the ponds since January of 2012," Parker explains. In a wet year, there would be about 2 to 3 feet in the fields, or recharge ponds as they're known at the water bank. "We still have water in the ground, so next year we'll continue to pump." These days, in Kern County, he says everyone is into water banking. "If you didn't have the water bank, what would happen is in those wet years when the State Water Project has surplus water, that water would just flow out into the ocean or in Kern County here, the water would flood farmland or it would go into the aqueduct and go south if they had capacity," says Parker, who is general manger of the Kern Water Bank, the largest groundwater banking operation in California and quite possibly the world. "It wouldn't be put to beneficial use. So what we're doing here is we're putting the water to beneficial use by capturing that surplus water, storing it up and having it available for when it's dry." And dry is a huge concern for a state that produces nearly half of United States-grown nuts, fruits and vegetables. In 2013, California's agriculture sector exported more than $21 billion in products. Even more than that, groundwater banking offers a flexible alternative for a state whose water storage system is predicated by surface reservoirs that rely on a melting snowpack. As the climate changes, most experts agree California is going to warm and lose its snowpack but gain more precipitation. Droughts are also expected to become more common. "So what are you going to do if you lose a big chunk of your annual storage?" asked Ellen Hanak, director of the Public Policy Institute of California's Water Policy Center. "It's a way both to store water for local users -- but also because of the innovation that some of the folks down in Kern have introduced -- it's a way for storing water for those who are not local users of that basin. I think it's a really important tool for California." The state Legislature agrees. In response to California's prolonged drought, in September 2014, Gov. Jerry Brown (D) signed into law the Sustainable Groundwater Management Act (SGMA). The legislation tasks local agencies with creating a sustainable groundwater management plan, with the first step for most water districts to measure and quantify just how much water they have underground. In some parts of the Central Valley, the rate in which groundwater is being pulled out exceeds the rate in which it can be replaced. The result, after years of overdraft, is the groundwater table has plummeted and, in some places, the land itself is sinking. Rates of subsidence are at nearly 2 inches a month, according to a recent report released by NASA and the California Department of Water Resources. The legislation gives the most-stressed basins until 2020 to adopt groundwater plans and until 2040 to achieve sustainability, and other basins have slightly longer to comply. The state will step in if agencies fail to act. Then there's Proposition 1. Passed in 2014 by California voters, Proposition 1 sets aside $2.7 billion for storage projects. The bond legislation specifies that the state will pay for no more than half of a project, which means buy-in has to be significant. "The incentives for doing it will be improved over time with the existence of SGMA," Hanak said. "If you look at the experience of this drought, one of the things that's really clear is that groundwater is our biggest drought reserve, and so managing it in such a way so that we have it for future droughts is incredibly important." From the short, severe drought in 1976-77 to a prolonged six-year drought in 1987-92, extended water shortages aren't a new thing in California. This latest drought, now in its fourth year, however, features two of the driest years in the state's 120 years of records. Fruit and almond grower Steve Jackson was forced to fallow his land located south of Kettleman City in the Central Valley when drought hit California in the early '90s. "We didn't have any income, but we survived," he said. "It taught us a lesson -- we needed a backup supply." And so when the Kern Water Bank was created in 1996, Jackson, who works closely with the water districts his land sits on, jumped at the chance to join. When this latest dry spell hit, that investment was Jackson's saving grace. Unlike some farmers, having stored water in the water bank meant he could get water -- 65-90 percent of normal -- even when the state curtailed allocations. At one point, Jackson and his father had about 1,800 acres of almonds, nectarines, plums and apricots, but today that number sits just under 800. They sold off some of the property, and last year, they began ripping out orchards. "We almost didn't make it," he said, adding conditions were so bad he couldn't even buy water on the open market. "When I say it's [the water bank] been our savior, it has been." But Jackson also acknowledges that without sustainable groundwater mining practices, the resource will not be able to support future agriculture. "Without water, we can't do anything," he added. "For us to really thrive, we have to find better, creative ways to capture water in wet years -- that's why you hear people pushing for storage." This year, the chance of a wetter-than-average winter is high in California due to a strengthening El Niño, according to a forecast by the National Weather Service's Climate Prediction Center released last week. There's a 40 percent chance the area around Lake Oroville, California's second-largest reservoir, will experience wetter-than-usual conditions. San Francisco now has more than a 50 percent chance of a very rainy winter, and Southern California is looking at a 60 percent chance. About an hour into the tour of the water bank, Parker pulls the truck up to what once was the Kern River. The bone-dry riverbed resembles a tree and shrub graveyard. We hike up, over the former river, to gaze upon a snaking cement channel, which brings water from Northern California to the south. Peering down, Parker points out a pipe, 11 feet in diameter, which transports water from the water bank's canal to the aqueduct. What's left of the Kern River after California's drought. Photo by Brittany Patterson. "This is the part of the project that people thought would never happen," he says, gesturing to the aqueduct. "People were concerned about water quality, environmental issues, that the endangered species that took over on the surface of the water bank would make it so we wouldn't be able to build anything and things like that. But we did." The water bank spent 2½ years constructing the infrastructure and many more meeting with downstream stakeholders, presenting water quality data and models and proving to everyone that the water once stored underground could be redistributed as safe drinking water. Parker said in the past the water bank had to reassure people they are not stealing water. "Everybody is really happy when we've been recharging water because all of their water tables are very high, but then when we pump, water levels drop." 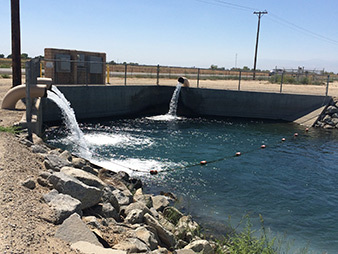 With this mechanism in place, complete with a strong monitoring and accounting system, the Kern Water Bank has shown it can function not only as a holding place for water, but that it can interact with the state's interconnected water infrastructure network. In a sense, the bank can "re-regulate" water, store it when it isn't needed and pump it out to thirsty users when it is. The drought has illuminated the state's need to re-examine its water infrastructure, but the appetite is small for building more reservoirs, and it isn't clear if they would be helpful as precipitation patterns change, Hanak said. "We have a lot of potential to retool our system in order to use our basic surface reservoir capacity with more flexibility," she said. Reservoirs capture melting snowpack and store water for use in hot dry summers. They're not as good at keeping enough water to get a state through a multiyear drought, in part because they have to leave enough room to store winter precipitation and protect against flooding. "We could concentrate on using them as temporary holding places and get dry-year water in the ground," she said. "It's down there, it's not evaporating. It's waiting for us in dry years, and we have a lot of room in our basins because we've been overdrafting in a lot of places for years." However, successful water banking takes more than just letting water seep into the ground. Nearly all of the groundwater storage in California is located near the Tulare Basin, and that's not a mistake. To begin, the geology in Kern County is prime for water banking. The below-ground aquifer is unconfined, meaning it's entirely open for storage and the groundwater quality is good. "And then the plumbing is really good," Parker adds. "We have access to water from all parts of the state." An added benefit to banking water is the ability to create a wildlife habitat, not cover one up as a reservoir does. With 7,000 acres of open, protected recharge ponds that serve as intermittent wetlands, wildlife ecologists have observed 66 waterfowl species and upward of 35,000 individual birds on the water bank. Because most of the land sits under a habitat conservation plan, part of a permit issued under the Endangered Species Act to private entities undertaking projects that might result in the destruction of an endangered or threatened species, Parker believes basically into perpetuity that the land will serve as a wildlife refuge. Less water is also lost to evaporation. That's not to say every drop that is recharged makes it back out, Parker said. The bank believes about 6 percent of water recharged is lost, or for every 100 acre-feet it brings in, it can bring back out 94 acre-feet. Unlike a reservoir where floodgates can be opened and water released immediately, the water bank must pump it back out. The Kern Water Authority, the entity that manages the water bank, has 85 wells, some as deep as 750 feet into the ground, to do the trick. The bank has an annual recovery capacity of about 240,000 per year, although, Parker notes, both the recharge and the recovery rates suffer as the total amount of water in the bank falls. The priority now is to ready the bank for a wet El Niño, and if that doesn't come to fruition, the bank intends to pump out water again next year. Parker says it estimates it has one more year's worth of water stored underground, about 120,000 acre-feet, which highlights an uncertainty even groundwater banking can't eliminate in California. "We can't provide enough water to fulfill all of the need," he says. "But we can provide enough water to help pretty significantly."